Myriads of emotions exist in one's deep breath within the nature. Aesthetic sensations dwell in the breaths and there are artists who express them. With different styles, the artists abundantly portray the true message of the nature. There are photographs, paintings, sculptures, and installations. Feel the message from the manifold projects of six great artists. Masculine, yet tranquil touch of the brush, which incorporates magnificent landscape of mountains that are consisted of pure colors, defines the styles of Artist Kie Soo Park's paintings. At his young age, Park spent most of his time dwelling in the mountains, which gave characteristics of innocence and reminiscence that are portrayed through his use of primary colors and rhythmic atmosphere. The thick layers of intense and soft oil paintings produce not only vigorous sensation of the mountains but also the quietness of the mother's breast. Water is a nature matter that embraces many meanings and symbols. Sandra Gottlieb, a photographer, has created the pictures of the skies and waters of the Atlantic Ocean. Gottlieb understood the "feelings of movement" and "awareness of change from moment to moment" from her experience of ballet and modern dancing. Horizontal lines of the pictures dramatically divide the skies and waters. Lines are pervaded with powerful colors and formulate the balance, which quietly creates a beautiful melody between softness and stability. Boonsun Lee's "In and Out: From is emptiness and emptiness is form", creates profound and deep meanings. Lee delicately expresses a man's repeating thoughts through her simple, yet intricate circles. A circle neither has a starting point nor an ending point. 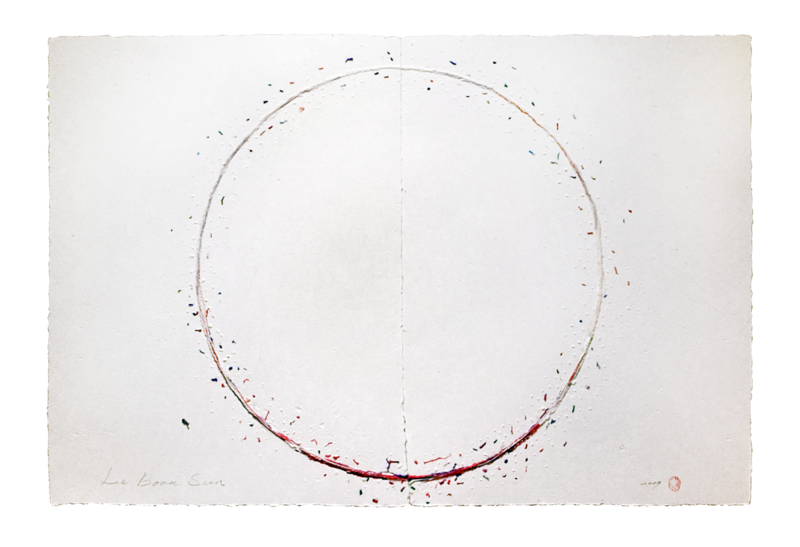 Various thickness and darkness of lines and colors with wandering dots around the circle represent the dynamic life of human beings �new beginnings, desired hope, and possibilities. Overall, her works of art creates a deep relationship between the endless circulation and the infinite thoughts of men. The theme of Nanyee Shon's project 'The Cycle of Rebirth' is bamboo, which is taken in black and white that resembles ink paintings. Traditionally, bamboos represent integrity and fidelity, a symbol of allegiance. Through this project, mixed media photographer Shon expresses her mother's rebirth and her longing for the mother, just like bamboo trees that reach out to the sky. The branches of the trees are the never-ending memories and an immortal life, hence the "continuation of life beyond the death of the physical body." As portrayed in Eunjin Jang's sculptures, the circulation of nature and art is the major theme. By using bronze, bark of woods, and Korean traditional Paper, Jang leaves unvarnished feeling and material of nature and scoops the beauty of art. By creating the art of nature, Jang infuses new spirits into each of her sculptures. Jang's sculptures resemble the nature, which is made in details that form an extensive feeling. Chung Yoon Kim's sculptures are characterized by a striking singularity of formal structure. Created by the joining two pieces of wood is very attractive as their awkwardness as they are for their graceful. Elevated on pedestals, the sculpture express them self as a figurative references to the human form which contains dualities of yin/yang and mind/body. The constructions evoked the reference and reverence of nature.